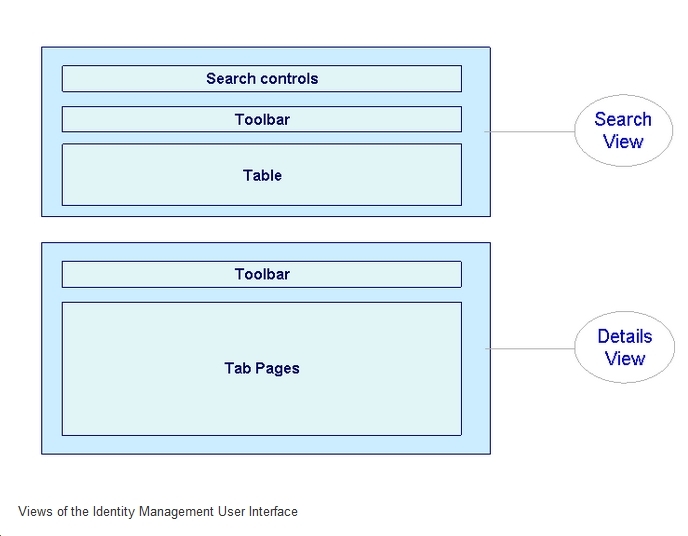 The user management administration console is a Web-based tool that provides administrators with the functions they need to manage users, groups, roles, and user-related data in SAP User Management Engine (UME). Choose System Management > Administration > Identity Management. Choose User Administration > Identity Management. 1. 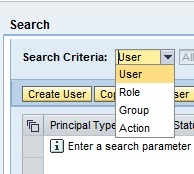 In the search area, choose the type of object you are looking for: user, group, or role. 2. Enter a string to search for. The search function searches for this string in the user ID (users only) and name. Use the asterisk (*) as a wildcard. If you do not enter any text, the search function returns a list of all users, groups, or roles, depending on the object you chose. A list of search results appears in the Search view. ● When searching for portal roles, you can only search for the URL path below the portal content directory (PCD). You cannot search for the full path. ● You can narrow the search by selecting the data source you want to search, if there is more than one data source. A federated portal network adds some complexity. For roles only, you can search remote data sources, meaning remote portal systems in your network. If you search All Data Sources this includes the remote portals. For all other principals (users, groups, and actions) the search only includes the data sources relevant to your local portal. 1. In the search area, choose User as the type of object you are looking for. 3. Enter your search criteria in the required fields in the various tabs. In the search results list, select the user, group, or role. The detailed information appears in the Details view. 1. In the search area, choose the type of object you wish to create. 3. Enter data as required in the Details view. 1. In the search results list, select the user you want to copy. 2. Choose Copy to New. 3. Enter a logon ID and define a password. 1. In the search results list, select the user, group, or role you want to change. 3. Change the data as required. SAP recommends that you do not delete users, rather lock the user and set the expiration date of the account. Only delete a user after a period of time in accordance with your local auditing regulations. 1. In the search results list, select a user, group, or role. If you delete a user, you are prompted to write a reason for deleting the user. This text is sent to the user in a notification e-mail, if you enabled e-mail notification. You cannot delete a portal role. You can only delete the group, user, and user mapping assignments. To delete the role itself you must do that with the portal content tools. 7) Change the logon alias of a user. To perform this activity, you must enable the use of a logon alias. For more information, see Using Basic Authentication (User ID and Password). 1. In the search results list, select a user. 3. Choose the Additional Information tab. 4. Change the data as required. 8) Lock or unlock a user. 9) Approve or reject a user. 10) Generate a new password for a user. 11) Assign a user to a group or a role. 12) Export user, group, or role data from the source system into a plain text file. Then you must convert the text file into a format supported by the import function. .
Users, groups, and roles can be uploaded from external systems to the User Management Engine (UME) using the import function. 1) You cannot import users, groups, and roles simultaneously in one import run. 2) The file size is restricted to 1MB. 3) The user, group, or role ID is used to uniquely identify the records in the import data and to match the imported user data with any existing users, groups, or roles. If you select Overwrite Existing Data, all fields in the import data will overwrite all existing field values for existing users, groups, or roles. No record is kept of previous values. 4) During import, user data is automatically replicated to any connected systems for which replication is configured. 1) Paste the content of a data file in the text area. 2) Upload user, group, or role data from a Text file. The delimiter between two parameters is "next line" . The users shyam, sunder, and Raj must already exist, otherwise an error occurs. Similarly, the groups group1 and group2 must already exist. Here you can get the Activity reports of User/Iviews/Pages. But before, you need to Activate Some functionality. Below is the link to do the same. User Administration > User Authorization Reports. 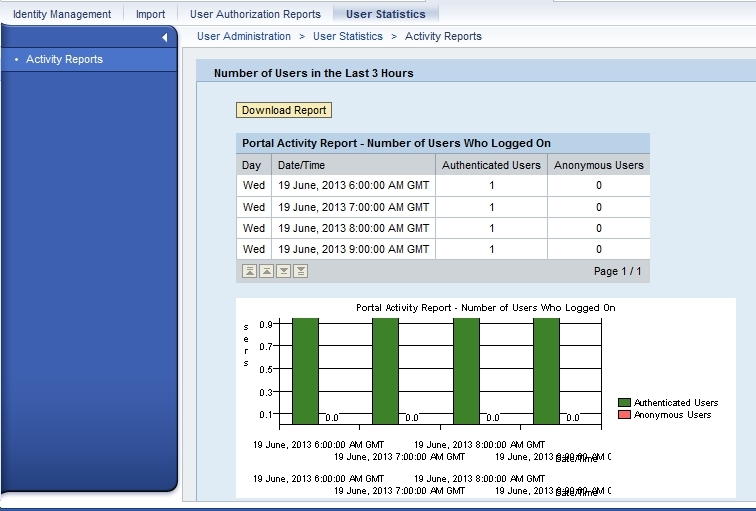 You can view the authorization reports based on Role/ User/ Group. This information is very good thanks for sharing it with us.it is very interesting.